What do we owe each other as members of a democratic society? Public goods—from clean water to health care to schools—are under siege in the United States, with access too often restricted by class and race. Against this background, Trump’s nearly empty White House symbolizes the crisis we face: our increasing abandonment of the idea of the public. At stake is not only what we owe to each other but who we are. Forum contributors include K. Sabeel Rahman (“Losing and Gaining Public Goods”), with respondents Elaine Kamarck, Michael Hardt, Jacob T. Levy, Lauren Jacobs, and Joshua Cohen. 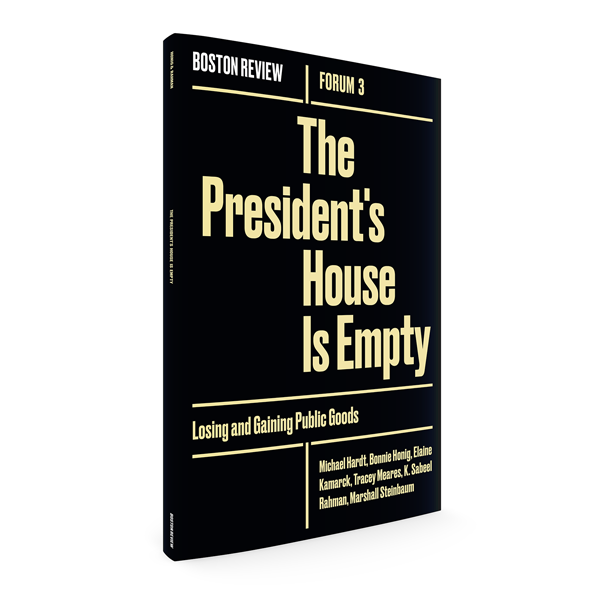 Also featuring essays by Bonnie Honig (“The President’s House Is Empty”), Bernardo Zacka (“Are Bureaucracies a Public Good?”), Marshall Steinbaum (“Free College for All”), Tracy Meares (“Policing: A Public Good Gone Bad”), Meghan O’Gieblyn (“The Worth of Water”), and Julian C. Chambliss (“Draining the Swamp”), with poems by Shane McCrae, Craig Santos Perez, and Sally Ball.